Dog First Aid Links Do You Want To Link With Us? At dog first aid links we are looking for link partners. Please click here to view our collection of valuable dog first aid resources for you. Did Dog First Aid 101 help you treat your dog's illness or injury? Did it help you prevent future problems? If it did, and you're as particular about whom you link to as we are, please help us get the word out to more dog owners. If your web site's about dogs, or pets in general, place a link on your site to this one. Your link to us helps convince the search engines that Dog First Aid 101 is a valuable dog first aid links / resources web site. We've included some suggested dog first aid links for you to use. Simply copy one of them from here and paste it into one of your site's pages. Suggested locations are your links/resources page, or on a specific topic page. If you can, please put the link on a page that's only one click away from the home page. We appreciate your support in helping us help dog owners around the world protect their dogs from harm and lessen canine suffering. Dog First Aid 101 provides information you can use to prevent injuries, illnesses and poisonings, and prepare for any that do happen to your dog. Learn dog first aid and save a life. 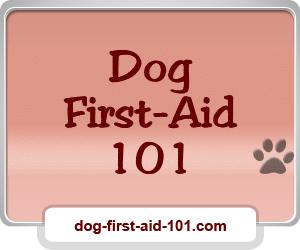 Dog First Aid 101 provides the information for you to save your dog's life. Learn dog first aid so you know how to prevent injuries, illnesses and poisonings, and how to prepare for any that do occur. You can save your dog's life with Dog First Aid 101. Learn how to prevent, prepare for and treat injuries, illnesses, and poisonings before something unbearable happens to your canine companion. The following is the code if you want to link with a 600x111 banner. The following is the code if you want to link with a 500x93 banner. The following is the code if you want to link with a 300x250. If you have a web site that provides valuable information, and that fits with the subject of dog first aid, dog health, or disaster preparedness, please complete the following form with the details. What page would you like to link with? Subscribe to It's A Dog's Life - YOUR Dog's! , our monthly newsletter with in depth information to help you keep your dog safe and healthy and some free Bonuses. Fill out the form below. You'll then receive an email asking you to confirm that you subscribed. And you'll always have the option to unsubscribe at the click of your mouse.